These pictures are a stroll down memory lane for me. I took them in mid-September of 2000. It was my second trip to Kelly Creek and this was my first digital camera. After reading stories of 20″ fish and fly fishing heaven, I had to try my luck. Since then, I’ve made it to Kelly at least once every year. It has never let me down. So in honor of my favorite stream, all the pictures in this post are from 2000. I’ve learned that while there are 20″ fish, and I have caught some, most of the fish are smaller. Your typical fish is usually around 10 inches. 12-15 inch fish are not uncommon. I usually camp near the bridge at the south-east end of the road access. Then day hike up the trail and fish. Another day I’ll cruise along the frontage road, hopping from hole to hole. 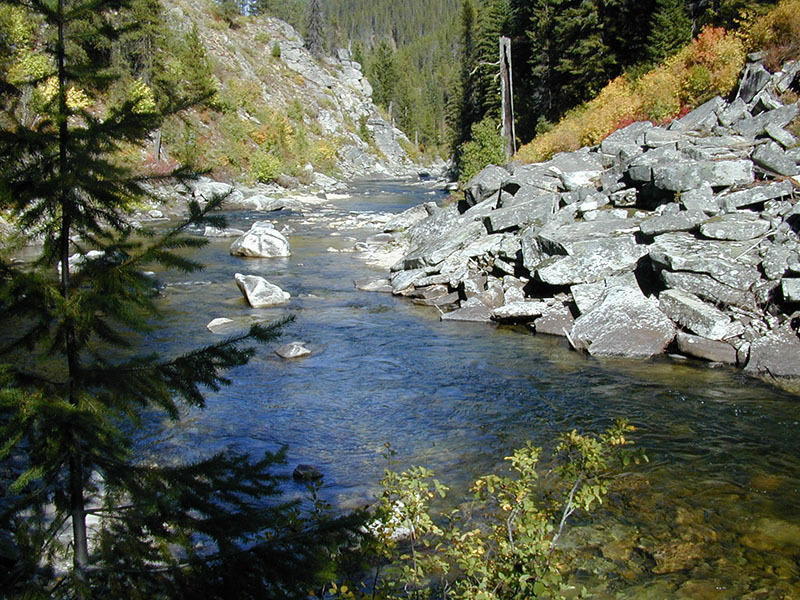 Sometimes I explore Moose Creek or the Little North Fork of the Clearwater. 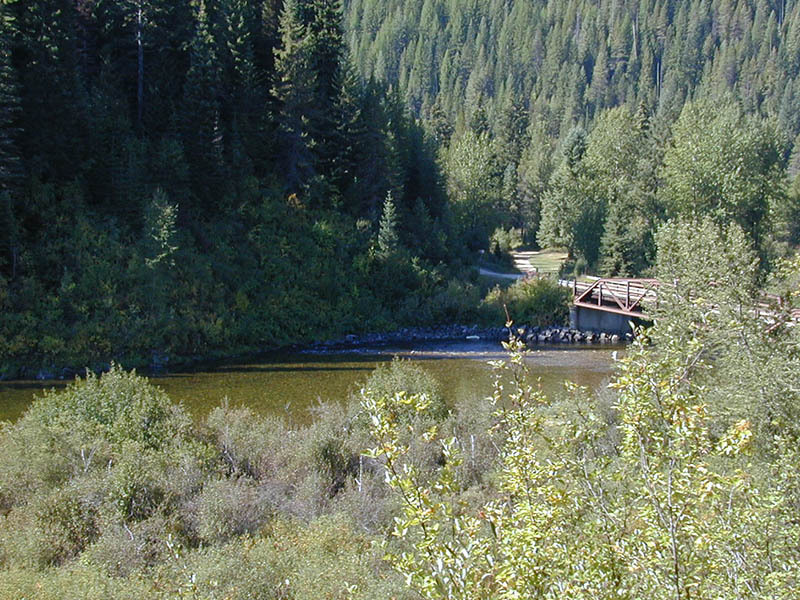 The picture on the right shows the trail above the bridge. I remember a magical day, fishing my way up stream, catching dozens and dozens of fish and never changing my fly all day. I’ve been to Kelly in June, August, September and October. September is my favorite time. The crowds have departed. You might even have the river to yourself. That time in October I was tent camping and it got down to 21 degrees. Just a little too nippy for my thinning blood. This picture was taken 9/15/2000. 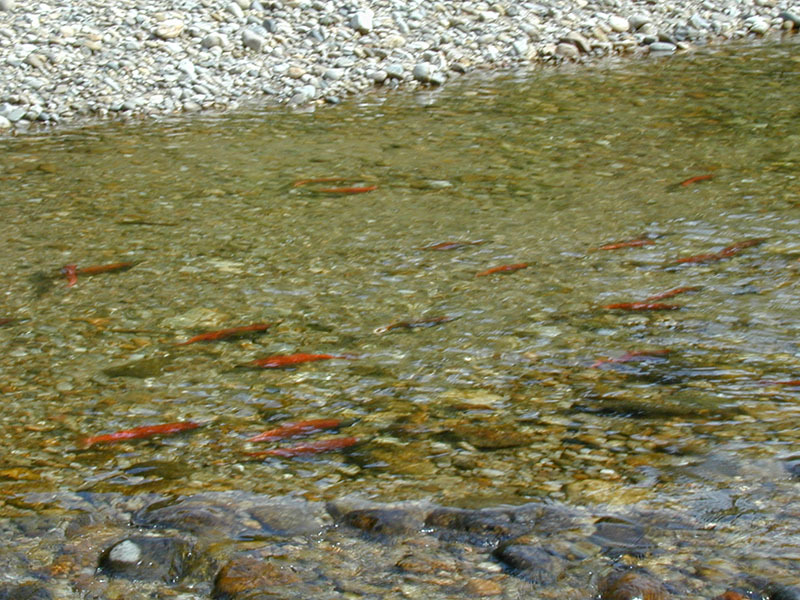 You can see the Kokanee had made it up there to spawn. They add color and interest to the stream. And the bear love them. I’ve never had a bear problem, but have seen them from a nice distance. Even in the heat of mid September, the mornings can be foggy and damp. The mist adds to the atmosphere of the river. I can’t wait to go back to the river again this year. Each time brings new treasures to discover. The river changes a little every visit. Some holes disappear, others are created. I’ve seen moose, bear, deer, mink, beaver, martin, coyote, elk, lots of different birds and of course, lots of fish. I find my pulse speeding up as I come down the hill from Lolo Pass. Not just the switchbacks in the road. It is the anticipation of another time at my favorite stream. 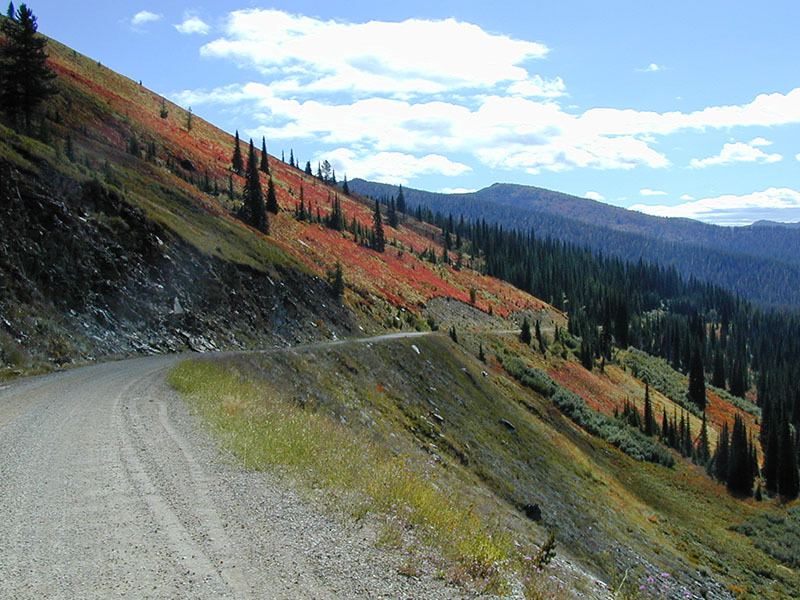 My favorite view of the drive is the top of HooDoo Pass, especially in September with the fall colors. This isn’t the best picture I have of it, but I had to stay true to the rule of the day. Only pictures from 2000. Tight lines. outstanding!! I noticed that I am shown as “probable”…No doubt…consider me “confirmed”!! No otters to compete with like my trip to the St. Joe? I’m IN. Now to stock the dries in the fly box and get the collection of 4wts packed and ready. 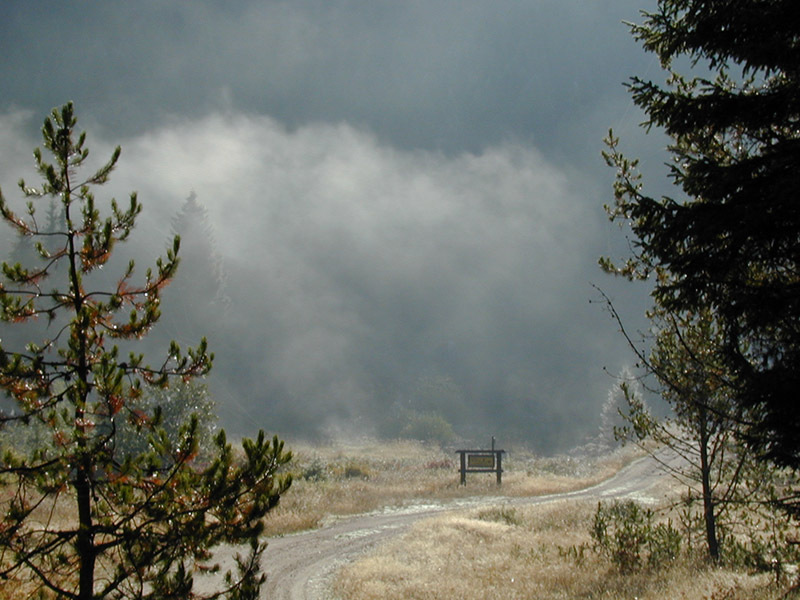 I was trail foreman at Kelly Creek Ranger Station from 1966 to 1969 and we used to have ten day trail camps from 4 to 10 miles up Kelly Creek from the Old Ranger Station. I went fishing about every evening after work and caught lots of trout. We ate one two messes of fish and than I would catch them and release them. The fishing was excellent. We got the day off when the men walked on the moon for the first time. 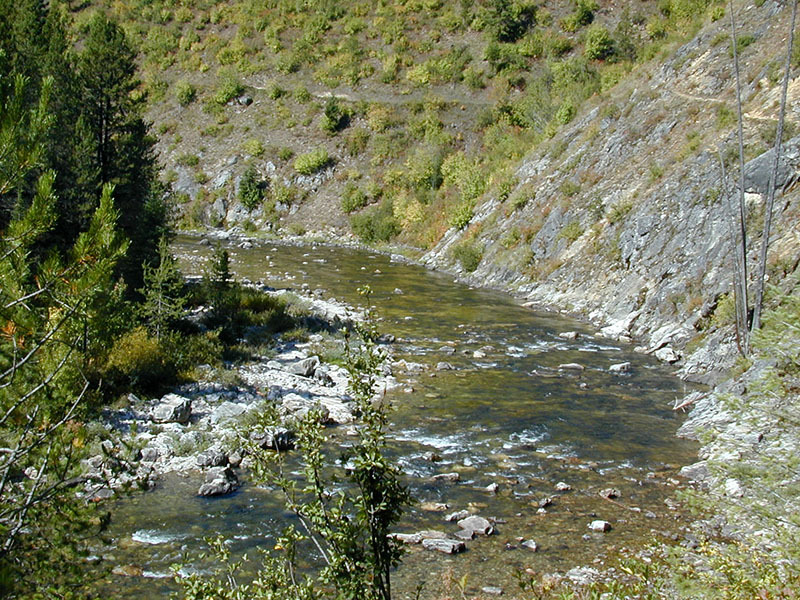 I caught a 23 inch Bull Trout right where the South Fork of Kelly Creek runs into Kelly Creek. That must have been a great experience. It’s hard work during the day, but the evenings must have been wonderful. I caught a bull trout on the St Joe, but never at Kelly. Thanks for sharing. 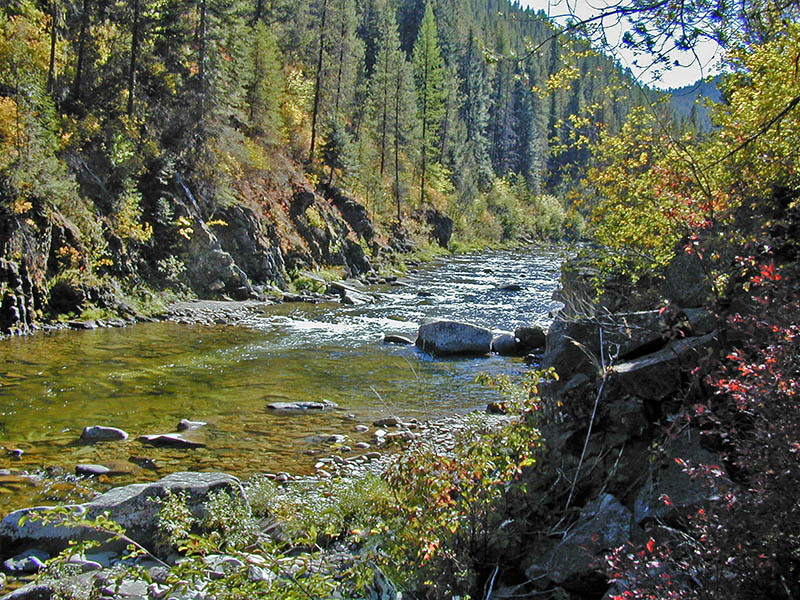 I worked lookouts in Kelly Creek Ranger District in 1945, was trail foreman in later years, packed mules until August 1951 when I received my Military notice while packing out smoke jumper at Kid Lake on the Montana/Idaho state line. Was two weeks late reporting for induction because of the fire season on the Clearwater National Forest. When I returned after my military I was transferred to Canyon Ranger District as the Dispatcher. I was lucky enough to stay at Cayuse Landing cabin with forest service mules and saddle horses while packing trail crews to various trail sites. Also manned the lookout on Lookout Mountain a short time. Packed mules for Irad Carr from Ousier Ridge lookout to fish lake. So very sad to see what the government has done to Kelly Creek, Bungalow and other buildings and sites that were built by CCC workers. I caught a lot of trout out of Kelly Creek and the North Fork of the Clearwater. Cruised timber for the forest service for the Diamond Match sale that went from The Cedars too Superior Montana and scaled logs on the trucks. That sale ruined a lot of wonderful forestry. Thanks for sharing that great bit of history.